I never cease to be amazed at the quality and range of artistic talent in Iceland, and the Icelandic Opera’s opening performance of “The Magic Flute” this past Saturday is no exception. The performance at Harpa was at once awesome and fun. Heartiest congratulations to the Icelandic Opera and best wishes for a successful season. I was delighted to welcome two Hybrid Ford Escapes to the Embassy’s vehicle fleet in Iceland. 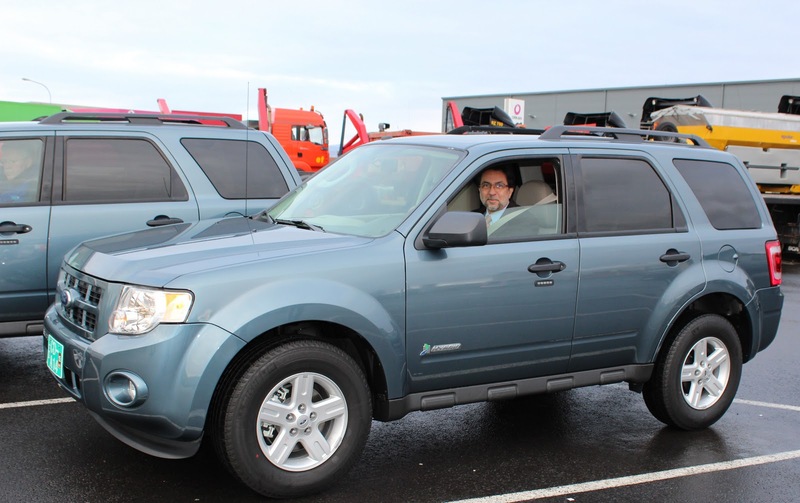 The use of these vehicles will make a modest contribution to American and Icelandic efforts to reduce our carbon footprint. The U.S. has been proactive in promoting the use of renewable energy at home and abroad, including through partnerships with Iceland and others to facilitate the use of geothermal energy in island nations. As our government also strives to use leading technologies in our own operations, we are delighted to do our part to lower our carbon footprint. We look forward to continuing to explore the use of green technology to improve our operations in Iceland. Mary and I had the pleasure of having an up close and personal look at Boeing’s new 747-8I, which was in Iceland recently to undergo performance testing. This is the latest version of Boeing’s veritable aircraft. While it looks very similar to previous 747 models, it shares its wing design, engines, interior, and cockpit with Boeing’s latest technological marvel: the 787 Dreamliner. Many of us dreamed of faraway places when we saw our first 747 so many years ago. It was quite exhilarating to have a close look at the newest version of the plane in one of the faraway places we once dreamed about. Iceland and Boeing’s partnership runs deep as Boeing has been coming to Iceland for years to test its aircraft under windy conditions and Icelandair’s entire fleet comes from Boeing.